Growing up in Southern California, five mins from the sunny beaches of Malibu, people often question why anyone would ever want to leave, but I did. Picture this: it’s a Wednesday afternoon in October. You have just finished your lectures for the day. As you walk out of the Exchange Building on the Penryn Campus, a gentle gust of soft, crisp air brushes across your cheeks. The sun is out, the weather is beautiful, so naturally what do you do? 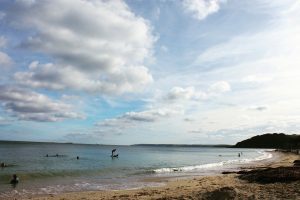 You get your friends together and head to Falmouth’s Gylly Beach, just a few miles from good old campus. As you make your way through town, you see scattered flocks of chattering students from every which direction trekking down to the beach: Disposable barbecue in one arm, burgers in the other, backpacks still on backs, grins ear to ear. The energy buzzing ‘round town becomes infectious and you too become as giddy and excited as the next. You step onto the soft, sandy beach, your eardrums are filled with laughter, music, and friends updating each other on the exciting lectures (and the not-so exciting lectures) of the day. Your nose is instantly greeted with the fresh scent of bonfires, and barbecues, and salt-water- the beach is packed! Some are tossing a ball or Frisbee; others are sat round the fire with friends doing the reading for the next day of lectures; and the rest are suiting up to take a dip in the water- it is a sight you truly cannot miss! This is why I came to Cornwall for University. These are the days I will forever remember when looking back at my experience during this exciting new chapter of my life, and these are the stories I tell my friends and family back at home when they ask me why I chose to move across the world-6000 miles from Malibu-to get a degree in Business. Hello! My name is Nicolette and I am a second year BSc Business student at the Penryn Campus. I am from Los Angeles, California and I like being outdoors, travelling and learning about different cultures, and I have a big passion for sustainable business and conservation. 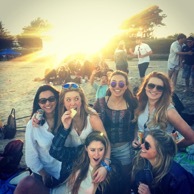 My favourite part about being an international student at the Penryn Campus is having the ability to mix with the incredibly diverse community that exists within our little Cornish haven, finding different ways to connect with each other everyday, and discovering how similar we all really are at the end of the day. Hopefully through sharing my own experiences with you, you will see how truly wonderful it is to be student in the global age we live in.